Hypokalemia is a medical term for low levels of potassium, a mineral that humans need for normal health. According to the textbook “Harrison’s Principles of Internal Medicine,” the most common cause of this imbalance is significant diarrhea or vomiting. Certain medications, such as the blood pressure medicines known as loop diuretics, may also cause an abnormally low level of potassium in the blood. One of the body systems affected by hypokalemia is the cardiovascular system. An electrocardiogram, or ECG, is a non-invasive way to look at the electrical activity of the heart. The various spikes, bumps and waves on the ECG tracing follow a specific pattern; if this pattern looks unusual, this may be a signal that something is wrong with the heart. 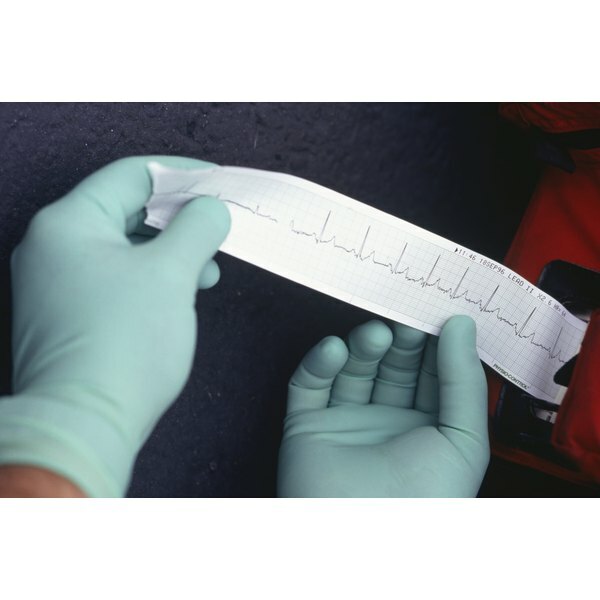 In the case of a patient with hypokalemia, there's an extra “bump” on the ECG tracing, called a “U" wave. According to Dr. Philip Podrid, writing in the medical reference UpToDate, it is not clear what electrical activity is occurring in the heart when the "U" wave appears on the ECG tracing. What is known is that a prominent "U" wave is often an indication of hypokalemia. According to the medical textbook “Principles of Critical Care,” hypokalemia patients are at great risk of developing ventricular fibrillation. Ventricular fibrillation is one of several ventricular arrhythmias--that is, abnormal heart rhythms that start out in the ventricles, which are the chambers of the heart that pump blood throughout the body. MedlinePlus describes ventricular fibrillation as a dangerous heart rhythm in which the muscle fibers that make up the ventricle contract in a random, uncontrolled way. When this occurs, the blood in the ventricles does not get pumped out to the rest of the body. If the person who is in ventricular fibrillation does not get immediate medical help, he will die due to cardiac arrest. Another effect of hypokalemia on the heart is called sinus bradycardia, a term used to describe a heart rate that is slower than 60 beats per minute. It occurs because the sinoatrial, or SA, node in the heart, sometimes called the “pacemaker” of the heart, is firing less frequently than usual. The SA node is where the electrical signal to begin a heart beat originates; if fewer electrical signals start off from the SA node, the heart beat will be slower than usual. A person with this type of rhythm is said to be in sinus bradycardia. Symptoms may include lightheadedness, fainting, headache or tiredness. In other cases, the person may not feel any symptoms from the slower heart rate.